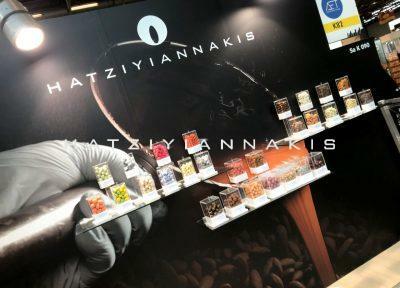 Dragees Hatziyiannakis participated in the “ISM 2018” exhibition, in Cologne, from the 28th of January until the 1st of February 2018 with great success. Once again, the exhibition gave the company the opportunity to meet its international partners. During the exhibition, our company presented our newest innovation: the vegetarian silver dragées line (gelatin free). 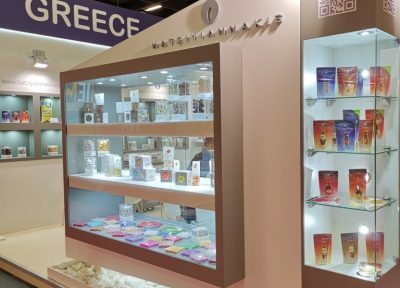 The new product line consists of decorative products with various cores (sugar, chocolate, nuts, cereals) coated with edible silver, gelatin free. As expected, the new product line attracted the attention of companies from all over the world, as it offers a unique alternative and a great choice for vegetarians. Another highlight of our participation was the unexpected visit of the German chef Dirk Hoffmann who, fascinated by our presence at the ISM, came by our booth to try our products and film part of his next TV show!